Happy Monday all! I hope everyone had a great holiday weekend. I also hope you were lucky enough to get a day off! Although that seems rare these days. Today I bring you crispy oven chips. 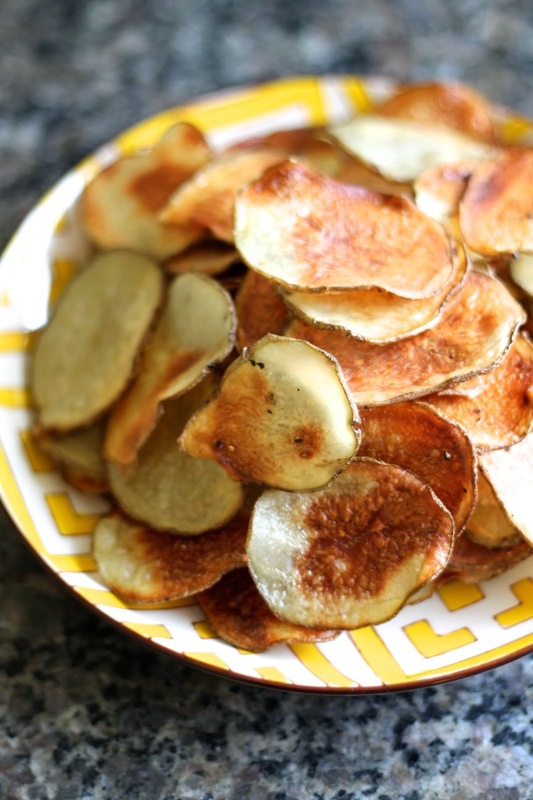 Who knew that you could make healthy, restaurant style potato chips with just a little heat and cooking spray? The first time I discovered this it was actually by mistake. I was trying out Martha Stewart's recipe for Muffin-Pan Potato Gratins and I ended up with a plethora of extra potatoes. Rather than making more gratins than I needed, I spread potatoes out on a cookie sheet and baked them. The results? Crispy perfection! And I have to say, we actually enjoyed them more than the gratins (sorry Martha). With these chips, you'll end up with the perfect combination of super crispy (Mike's favorite) and crispy yet still chewy (my favorite), but if you want all crispy or all chewy, you could time the potatoes accordingly! Position oven racks in the top and lower third of the oven. Preheat the oven to 400. Slice potatoes as thinly as possible (I used a mandolin). Spray a cookie sheet lightly with cooking spray and arrange potatoes in a single layer on the pan. Spray the top of the potatoes with more cooking spray (they shouldn't be soaked, just lightly oiled). Bake the potatoes for 10 minutes, then flip the potatoes and also rotate the pans in the oven. Bake for another 10 minutes, then remove any potatoes that are totally browned. Continue baking until all potatoes are crispy (about 25-30 minutes total). Serve with ketchup, ranch, or whatever you heart desires. Enjoy!